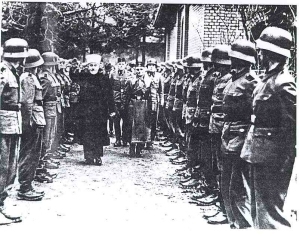 This picture was taken in 1943 and shows the Grand Mufti of Jerusalem Haj Amin el-Husseini reviewing Bosnian-Muslim troops - a unit of the "Hanjar (Saber) Division" of the Waffen SS, which he personally recruited for Hitler. Once in Berlin, the Mufti received an enthusiastic reception by the "Islamische Zentralinstitut" and the whole Islamic community of Germany, which welcomed him as the "Führer of the Arabic world." In an introductory speech, he called the Jews the "most fierce enemies of the Muslims" and an "ever corruptive element" in the world. Husseini soon became an honored guest of the Nazi leadership and met on several occasions with Hitler. He personally lobbied the Führer against the plan to let Jews leave Hungary, fearing they would immigrate to Palestine. He also strongly intervened when Adolf Eichman tried to cut a deal with the British government to exchange German POWs for 5000 Jewish children who also could have fled to Palestine. The Mufti's protests with the SS were successful, as the children were sent to death camps in Poland instead. Israeli Prime Minister, Binyamin Netanyahu caused quite a stir with remarks made in a speech before the World Zionist Congress that the founder of the Palestinian people, Haj Amin al-Husseini, convinced Adolf Hitler to eradicate rather than expel the Jews of Europe. The stir was apparently because it was an overstatement of Husseini’s role;the Holocaust was not Husseini’s idea. But he was a partner in perpetrating and promoting it. He also made it inevitable. Caroline Glick writes - "Crazy like a fox"
It is true that Hitler didn’t need Husseini to convince him to annihilate European Jewry. By the time Husseini arrived in Germany, the Nazis had already murdered a million Jews. But Netanyahu’s claim that Husseini made it impossible for Hitler to suffice with expelling the Jews from Europe is true. The only place that wanted the Jews of Europe was the nascent Jewish state in the Land of Israel. As Netanyahu said, Husseini is revered and glorified by the Palestinians. Yasser Arafat claimed that he was Husseini’s political heir and blood relative as a means of legitimizing his claim to leadership over the Palestinians. Hamas as well has invoked Husseini as its ideological founding father.